What is there to say about Änglagård's Hybris? 1993's Hybris is one of the top prog albums released since 1969. This album features four tracks ranging between 8-12 minutes in length. The four compositions overflow with aggressive Rickenbacker bass and Hammond organ riffs, hell-ish mellotron, Fripp-inspired guitar lines, and gentle Swedish-folk melodies. Änglagård formed in the early 1990s as a reaction to the terrible neo-prog of the late 1980s. Their goal was to bring respect back to progressive rock, and did they ever! The band's second album, Epilog, is also a classic. If you're new to the prog scene, quickly add this CD to your collection. Atlas were a decent, all-instrumental, prog band heavily influenced by early Genesis. Overall, Bla Vardag features pleasant compositions that will satisfy most prog collectors. The bonus material added to the CD makes-up for the weaker material on the original LP. Barndomens Stigar is Kultivator's only album. The music has plenty in common with the Zeuhl movement; However, I wouldn't call Barnsdomens Stigar a "Zeuhl" album. You can hear obvious Magma-influences: furious bass and Fender Rhodes chops, ritualistic themes, and Magma-like vocals. But, the music doesn't really sound anything like other Zeuhl bands due to the mixing-in of traditional prog rock and traditional folk influences from Sweden. If you can still find this CD, grab it! This album friggin' smokes! Mats/Morgan have been playing the game for quite a while. Keyboardist Mats Öberg and drummer Morgan Ågren started on their instruments at an early age, and quickly became obsessed with progressive rock and especially the music of Frank Zappa. By the time both musicians turned 20, they were invited by Frank Zappa to play at one of his Stockholm concerts, and later collaborated with Zappa on several projects. While that might seem impressive, chances are gifted musicians rarely become great composers. But as luck would have it, both of these musicians composed some of the wildest progressive fusion that I've heard in a while. 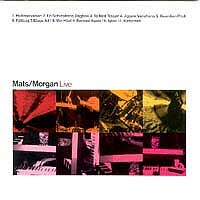 I'm not familiar with the studio work from Mats/Morgan, but someone told me that this live album offers listeners a no-nonsense approach to their studio work. The music is pushed to the limit, without any studio trickery. New listeners will instantly notice the amount of ideas that these two guys have to offer. Along with a guitarist, bass, and 2 other keyboardists the band zips through section after section of complex fusion-prog influenced by the likes of Hatfield and the North, National Health, Frank Zappa, and even Univers Zero. The Frank Zappa influenced tracks are so complex, and rich with detail, that most listeners will have to reflect on what exactly they have just heard. Mats plays the keyboards like a virtuoso from the English Cantebury prog scene and also like a disciple of George Duke. If you thought Dave Stewart's playing was as funky as it got, Mats offers serious competition. Several tracks also recall the fusion days of Chick Corea, and the peak days of Iceberg. Fortunately for Mats and Morgan, they also found some incredible backing musicians. Although the other guys don't offer their own compositions, their playing is top-notch. Overall, my friends, Live is a progressive-fusion classic. Don't be fooled by its 1999 release date!